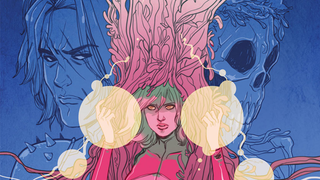 It’s not every day you see a comic company actively want to ensure that most of their readers don’t get their hands on their latest comic, but that’s the aim with Legends of the Geomancer, a new tie-in for Valiant Comics’ upcoming Book of Death event. Huh. The new series, penned by Fred Van Lente with art by Juan Jose Ryp, will be released as an incentive to comic book retailers in the way variant comic covers are usually released — in what is apparently a first for an actual series of comic books. Copies of each of the four issues will only be made in limited runs, and given to retailers based on their orders for the main Book of Death issues. To boot, Valiant doesn’t intend to even collect Legends of the Geomancer as a trade paperback after the fact, basically meaning that once the copies are out in the wild, that’s all there’ll be. So why go through all this trouble to get as few people as possible to read the series? To make the contents akin to a Legend of their own, according to Valiant. This is a little known story, the history of which is only known to a select few of the most important players in the Valiant Universe, and it’s telling will mirror its method of distribution. This will be a rare series that we hope fans will seek, much as they did decades ago for tales like the original ‘Harbinger’ #0. Honestly, it’s a pretty neat idea, connecting the series into the Valiant lore in a fun way and making the series special in the process. But in this era of digital comic scans being the norm, I’m thinking that the Geomancer’s Legends may not end up being as legendarily secret as Valiant wants them to be.